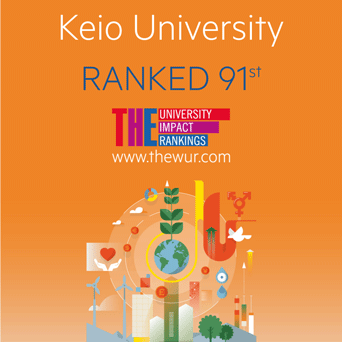 Keio University was ranked 91st in the world in the Times Higher Education (THE) University Impact Rankings 2019 (hereinafter "Impact Rankings") announced on April 3 (Wed.), 2019. From Japan, 3 universities were ranked in the top 100, namely Kyoto University (48th), the University of Tokyo (52nd), and Keio University. The Impact Rankings, which was carried out for the first time this year, measures the social and economic impact (influence) of universities. Participation was seen from over 450 universities (including 42 from Japan) in 76 countries worldwide. The Impact Rankings assess universities against 11 of the 17 Sustainable Development Goals (SDGs) set by the United Nations, and in addition to the overall ranking, individual rankings for each of the 11 goals surveyed are also available. Keio University was ranked 37th in the world and 1st among Japanese universities for Goal 17 (Partnerships for the Goals).